Dating abuse is when one partner tries to exert power or control over his or her dating partner. It can be a pattern of abusive behaviors that develop over time. 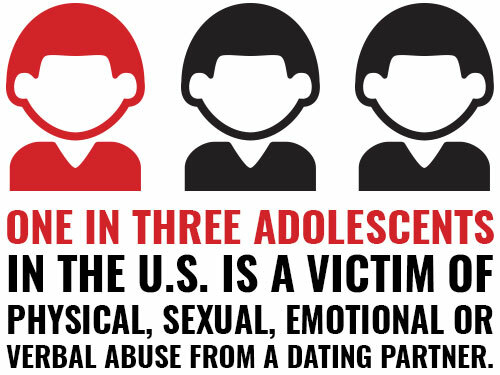 Unfortunately, violence in dating relationships is not uncommon: dating abuse affects around 1.5 million teens annually, and statistics show that 1 in 3 teenagers has experienced dating violence. Dating violence can affect anyone. Although most victims are women — who are also at greater risk for serious injury — it affects men as well. Click here for a checklist and quizzes on elements of healthy, unhealthy, and even abusive relationships. If you (or someone you care about) is in an unhealthy relationship or is a victim of dating violence, know that you are not alone. Help and support are available. No one deserves to be abused or threatened. Remember that you cannot change your batterer, and in time, the violence will get worse, sometimes lethal. You need to take care of yourself. Talk to an adult you can trust, locate a shelter or agency serving victims of intimate partner violence/domestic abuse in your community, or call the National Domestic Violence Hotline at 800-799-SAFE (7233). Peace Over Violence In Touch With Teens (ITWT) program works to prevent the tragedy of relationship violence through education, advocacy, and organizing. Love is Respect (originally the National Dating Abuse Helpline) engages and empowers young people to end abusive relationships. They have peer advocates available 24/7. Call 866-331-9474 or TTY: 866-331-8453. Or you can text “loveis” to 77054 (standard text rates apply). For an interactive tool explaining what abuse may look like in unhealthy teen dating relationships, refer to The Power and Control Wheel as provided by Loveisrespect.org. If you or someone you know is in immediate danger, call 911 right away. Get the Media Kit | Website built by OHCA Creative.